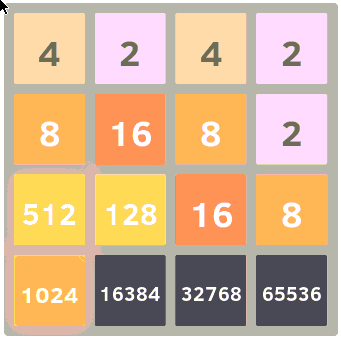 Now that I’m getting near the end of the highest tile on 2048, the air is getting thin. where I need a four – not a two – to drop in on the top. Since fours are less frequent than twos, I have to start up, try, quit, and repeat multiple times, which gets quite tedious. So I automated it using visgrep. visgrep is a seemingly obscure tool (part of the xautomation package on ubuntu) to search for images within other images. I won’t go into its use here (it’s _not_ user-friendly and in-depth documentation is perhaps kept by monks somewhere), but there is a man page. Did you expose ports 5901 and 6080? If so, then vnclient localhost:1 should work. So when I see an “OK” and a prompt within the container I know I can vnc in and continue playing. The time saved by doing this is significant. I’m not really a game player, but I imagine this principle could be applied to a lot of games. Also, the process could be made much more slick, as this is still very much by-hand.